Our tailbone supports and stabilizes us as we sit, but sitting for long periods of time can affect this area. With PharMeDoc’s coccyx cushion, you can immediately ease the pressure on your hips, back, and tailbone. Our coccyx cushion is made with high-quality foam that won’t flatten after long-term use while the orthopedic-designed rear cutout reduces pressure on the tailbone and eases tailbone pain. The coccyx orthopedic cushion is compact and easy to travel with, from your car seat to your office chair and fits into bus, train, and plane seats. Nylon mesh cover is zipper-removable for fast and efficient cleaning. Why Use a Coccyx Cushion? The coccyx (commonly referred to as the “tailbone”) is located at the end of your spine. It’s also something we don’t think about often while we sit, but long periods of sitting play a major role in tailbone and back pain. The tailbone pillow is ideal for people with long commutes who need a car seat cushion, people who need back support for their chairs, as well as those recovering from an injury, seeking sciatica pain relief, or suffering from coccydynia (tailbone pain – sometimes caused by pregnancy). The coccyx pillow eases pain and also ensures that we’re taking care of our tailbone in the long run. If we don’t, we’ll wear out our natural back support, which often results in arthritis. DESIGNED TO HELP RELIEVE TAILBONE PAIN AND DISCOMFORT. 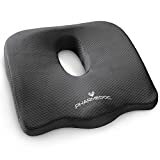 Our contoured seat cushion for office chair is crafted to help relieve lower backaches and sciatica pains by incorporating durable foam material and an ergonomic design. This office chair cushion retains its shape after prolonged use for long lasting benefits. ONE SIZE FITS ALL TAILBONE CUSHION. The coccyx cushion pillow for chairs is great for your office chair, car seat, as a wheelchair cushion, or desk at home. This multi-purpose orthopedic tailbone pillow is built to support your body wherever you go. HELPS IMPROVE POSTURE AND REALIGN YOUR SPINE. The rear cut-out of this tailbone pillow and ergonomic seat cushion design encourage a healthy sitting position to help prevent muscle fatigue and convey confidence. PORTABLE, LIGHTWEIGHT, AND EASY TO MAINTAIN. The coccyx pillow is portable and made with convenience in mind. Our office chair cushion also features a removable and washable mesh cover that enhances breathability and prevents retention of heat. • Unzip and machine wash with next to no effort.